Do you know that fear of doing two things at once and thinking that one of them might just not be as good as the other? This does not stand up for Firehouse Subs, a restaurant chain that seems to spread as fast as fresh air. Many of you might already know it. But those who enjoy eating their favorite food inside their house may prefer Firehouse Subs Delivery. This review includes information on the restaurant, delivery areas, time, and fees. You can also read additional information which might help you when ordering. 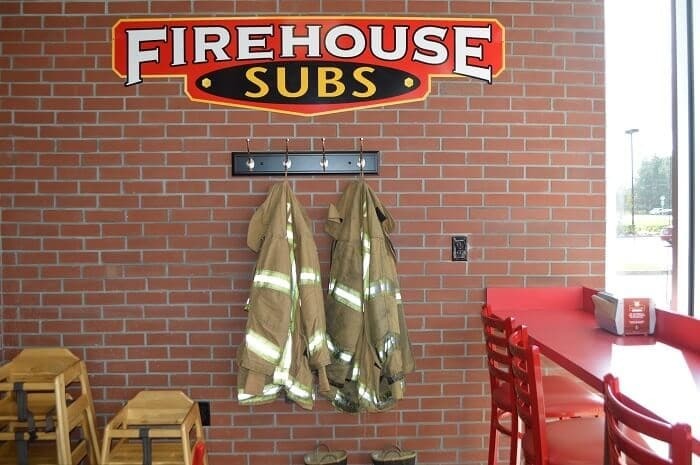 Firehouse Subs was founded by 2 two-generation firefighters who wanted to make a strong connection between food and public safety. You can choose a restaurant just because, by eating, you accomplish a good deed. But you can return, or even order at home because you enjoyed the food and be glad that the good deed is also there. Chris and Robin Sorensen founded the first restaurant already having the idea of planning a way to put their passion for cooking into practice, while offering support to firefighters from local departments. With this thought, the sons of firefighters opened their first restaurant back in 1994. Today, there are 1,050 restaurants, many of which include the Firehouse Subs delivery service. In 2016, the restaurants had around $600 million in sales and they continue to expand. The restaurants include trademark sandwiches, and salads, as well as hot sauces. However, their menu also includes chips, drink, and meals especially made for kids. The restaurant is, actually, family friendly and the employees have been praised by customers plenty of times. Firehouse Subs Delivery hands orders itself. But you can also order through a third-party platform, especially if you are not located in one of the below states. Firehouse Subs Delivery covers around 44 American states. You can find Firehouse Subs Delivery in Alabama, Arkansas, Arizona, California, Colorado, Connecticut, Florida, Georgia, Iowa, Idaho, Illinois, Indiana, Kansas, Kentucky, Louisiana, Massachusetts, Maryland, Maine, Michigan, Minnesota, Missouri, Mississippi, Montana, North Carolina, North Dakota, Nebraska, New Hampshire, New Jersey, New Mexico, Nevada, New York, Ohio, Oklahoma, Oregon, Pennsylvania, South Carolina, South Dakota, Tennessee, Texas, Utah, Virginia, Washington, Wisconsin, West Virginia. Most of the restaurants are found in Florida (225), Texas (112), and Georgia (104). However, there is only one restaurant in the below states, so you might need to order through a third-party platform. However, you should search for the restaurants in your state based on your ZIP code, as one of them might even be close to your home. Some restaurants are also open in Canada and Mexico. But they are not available for direct delivery. You can order your lunch or dinner from Firehouse Subs Delivery based on the closest restaurant’s schedule. When they are closed, restaurants don’t take orders. However, these may vary depending on each restaurant. An example of the Firehouse Subs Delivery hours of operations is Monday – Saturday between 11 AM – 11 PM and Sunday, 12 AM – 10 PM. These may not apply to your restaurant. There is not a specific timeframe for the online order to arrive to your home. Each depends on your location and the time of your order. For further information, you should ask for a confirmation of the time frame when placing the online order. Delivery fee from the platform. Please note that each platform/ Firehouse Subs restaurant has its own ranges of prices. Therefore, you also might find differences when it comes to minimum order values. The restaurant does mention that if you become a member of their community by subscribing to the newsletter, you can benefit from exclusive offers. Also, Firehouse Subs Delivery also developed an application which will show you all the above details at first hand. Firehouse Subs Delivery also includes gluten-free sandwiches, cheeses, and salads. The restaurant has its own foundation, which sends 0.13 percent of the amounts earned from each purchase to local teams for firefighting equipment. Firehouse Subs Public Safety Foundation has donated, throughout the years, more than $25 million for equipment and training of hometown firefighters. Nutrition information on each item you want to purchase is available online, together with a calculator. Firehouse Subs and Firehouse Subs Delivery are franchises. The owners encourage readers to look at what the process of owning a franchise involves. Most of the foods are available in small, medium, or large sizes. The Firehouse Subs Delivery menu also includes catering options for companies. Firehouse Subs Delivery promises to offer tasty and affordable options. But the most unforgettable aspect of their servings is the trademark that they use for clients’ favorite sandwiches. If you haven’t ordered from them yet, you should try one of their offers and give back an honest opinion on their online website, or even on Facebook, or Instagram. Have you used the Firehouse Subs delivery service? How was your experience? Share your story with other users! Hey Buddy!, I found this information for you: "Firehouse Subs Delivery 101: Areas, Hours, Fees". Here is the website link: https://all2door.com/firehouse-subs-delivery/. Thank you.